Chaos Black Metal extremists Revenge are scheduled to lay waste to venues throughout Europe alongside obscure Polish metal cult Mgła. The ”Vision – Discipline – Contempt Conquest” tour will hit Europe in April/May 2019, with Deus Mortem (April 28th – May 6th) and Doombringer (May 8th – May 17th) as support. Expect nothing less than total annihilation. 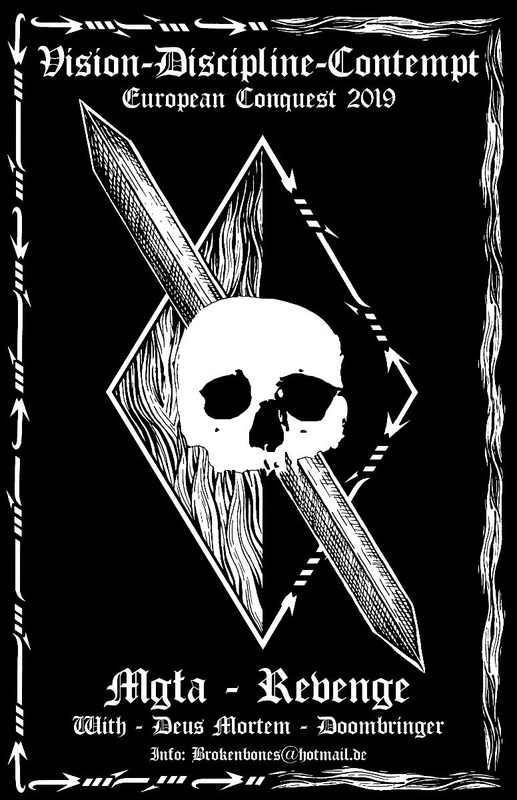 It’s been a few years since Revenge stormed the black metal scene with latest full length ”Behold.Total.Rejection” (2015). Now, the Canadian extreme metallers have returned with two new songs. The upcoming EP ”Deceiver.Diseased.Miasmic’‘ represents a new chapter in the band’s nihilistic and hateful mission against the world. With each release, J. Read has pushed the limits further. The two early EPs ”Attack.Blood.Revenge” (2001) and ”Superion.Command.Destroy” (2002) were followed by first full-length ”Triumph.Genocide.Antichrist” (2003). Each release was either greeted by stunned enthusiasm or sheer hatred by critics and fans alike. There was never any room for middle ground with punishing albums such as ”Victory.Intolerance.Mastery” (2004), ”Infiltration.Downfall.Death” (2008), ”Scum.Collapse.Eradication” (2011), and ”Behold.Total.Rejection” (2015). Immersed in a thick layer of sonic muck, the beastly grunts and spiteful screams, the crusty guitar sound and the assaulting drums drown out any pretense of accessibility and affability. ”Deceiver.Diseased.Miasmic” emanates a grubby atmosphere, pushing the limits even further than on previous efforts. Vltimas premieres the new song called “Praevalidus”, and album details of forthcoming release called “Something Wicked Marches In”!